On our adoption journey, we have encountered some interesting… and heartbreaking…. situations. We are used to people not understanding why we want more than a few kids. That has been an issue with people since passing the #3 mark. Passing the #4 mark for sure. We are sadly familiar with racism in certain areas of the country and in the media. It has been a whole new issue though, as we pursue adoption. And it breaks my heart. Even more. We are not used to the idea that us adopting a non-white child is a horrible idea. That has me reeling and hurting. Christians should not be racist. Ever. It goes against God’s Word. If you believe otherwise, then you are deceived. And you have succumbed to cultural lies. Here are our reasons for why we are open to welcoming any race of baby into our home. 1) Christ preached against racism. Like a fantastic article said, “racism is often viewed as a bad habit rather than grievous sin”. It is a sin. 2) If we did not accept babies of any race because of how other people believe, including people we love dearly, then we would be allowing their racism to dictate our decisions. It’s not just their preferences, but their sin. 3) God wants us to love and honor family and other people in our lives, but we are to submit our wills and our decisions to His teaching, glory, and honor. In Scripture we are told to choose Christ over all and He is to be LORD of our life, including our racial relationships. 4) We do not want to perpetuate racism with our lack of action. Paul and I aren’t racist and I’m glad. If we refuse babies of color because of how other people feel, then we are being racist and we are continuing to carry on a horrible and dishonoring (to God and man) behavior passed to us by others instead of letting it end with them. 5) Our loyalty lies with Christ, not man. Any man. 6) We could perhaps thwart the only opportunity some people will ever have to develop a personal relationship with a person of color if we limit our choice to white babies. Instead of viewing this as a bad opportunity for racist people, it could end up being the crack in their thinking. True, it might not happen: God might not bring us a baby of color AND/OR people in our lives may not change their thinking. We don’t want to be the ones to help them continue keeping this barrier though. 7) We need to demonstrate to our children that Christ’s teaching comes first. 8) We could kill any small bits of racism in our own hearts. We do not believe we are racist, but neither of us dated people of color. I know I never considered it. I simply wasn’t attracted. I wonder why though? Was it only chemical or did the racism in the culture where we grew up affect us enough that we were not attracted to people that God says are equal? 9) We have to be willing to sacrifice for Christ. Yes, we may lose relationships if we adopt a child of color. That is a sad truth. Yet, our hearts and our minds tells us that we have to be willing to sacrifice any relationship out of honor to the LORD, to show love to a mother that believes the best choice she can make is for her baby to grow up with us, to show the love of God to a child that doesn’t “match” us. 10) After realizing that the Civil Rights leaders worked hard to get us to this point in our culture, we feel like the baton has been passed to us to make sure we continue it. This could be our opportunity to live out the truth that “all men are created equal” and that God makes “no distinction between Greek and Jew”. Compared to what many sacrificed (the Freedom Riders, for example) to get us to this point as a nation, it’s little. 11) We know that the African American (AA) community is losing huge numbers because of abortion (there were more AA babies aborted last year in New York City than there were born) and is having its children not have forever families (being placed and left in the foster care system) because AA boys are the least adopted, well…. it breaks our heart. It breaks our heart to know that and not be willing to do anything about it. I know that it’s sad that the AA community is not stepping up to adopt AA boys, but I also know that the white community is also not stepping up. Could we, as the church, be being tested by God? It’s possible. If so, we are failing. 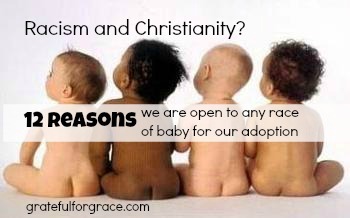 So, those are our reasons for not limiting our adoption application to white only or only to a couple of different races of babies. It is not a popular decision with people in our lives and that is heartbreaking. It could cost us dearly. But Christ is worth so much more. Have you encountered racism in your life? How?